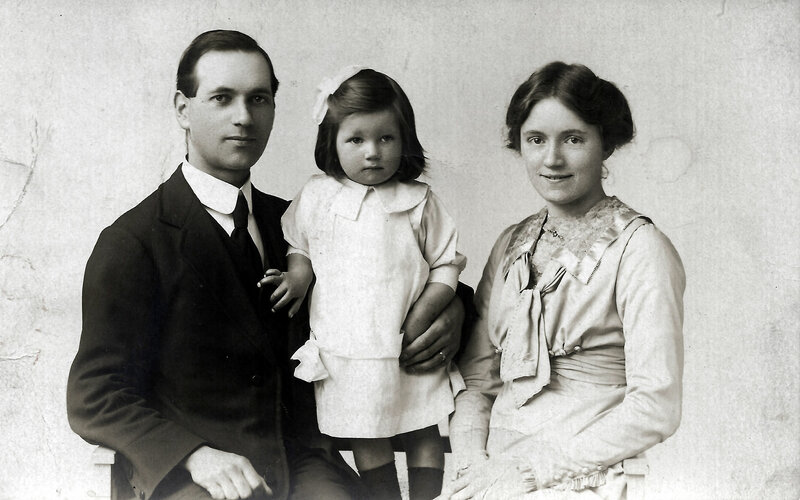 The first Hilda mentioned, on 1 January 1914, was his brother Ernie’s wife, née Tulip. Although Ernie was working away from Sunderland when he became engaged and was married (first at a bookshop in Waterford, now in the Irish Republic, then in St. Andrews – ALL visited Ernie and Hilda there while on holiday in 1915), Hilda Tulip was a Sunderland girl: a G. W. Tulip, very possibly her father, was Secretary of the South Durham Street United Methodist Church which the Linfoot family attended; his name is recorded in the Bibles presented respectively in 1905 to ALL’s sister, Mary (‘Marmie’), and to Marmie’s future husband Joe Wiseman when he went to work in Lincoln, and presented to Marmie herself in 1911 when they were married. There are some 24 certain references to Ernie’s wife Hilda, all in the earlier part of the Diary before ALL went to France. The second Hilda, mentioned for the first time on 31 January 1914 when a (delayed) birthday card for ALL arrived from her, was the daughter (thought to be the eldest) of ALL’s uncle Charles Poulter Linfoot (and thus ALL’s first cousin), who with his brother (ALL’s uncle) William Gaylard Linfoot and their respective families had emigrated to New Zealand in July 1912. There are also eight references to New Zealand, without a personal name, concerning letters sent or received, most or all of which may well have been to or from Hilda – who had the middle name Tate, from her mother Isabella née Tate. The third Hilda is generally mentioned in conjunction with ‘Jack’, and sometimes in connection also with one or two Uncle Jacks. Sadly, we have not up to the present time been able to find the surname of any of these four people, nor to establish their relationship with ALL; though it seems likely that ‘Jack and Hilda’ were of his generation, and possible that Jack was a cousin, though not necessarily a first cousin. It is uncertain in several instances whether this is the Hilda referred to by ALL, or Ernie’s Hilda. The possible fourth Hilda is the Hilda Fraser mentioned (as being ill) on 9 April 1914. Fraser may have been the surname of Jack’s Hilda (if she wasn’t another Linfoot); or Hilda Fraser might have been someone different, not mentioned otherwise in ALL’s Diary. This Hilda Tate Linfoot, Authur’s cousin was my late Grandmothers sister. She was a good writer hence why she wrote to her cousin from ,new Zealand. Hilda was one of six girls. There would have been seven girls but one died before Nana’s youngest sister. Therefore Aggie,Lily, Florence, Hilda, my gran Isabella and Alice would have been his cousins as well. Just so you know about Charles Linfoots family.